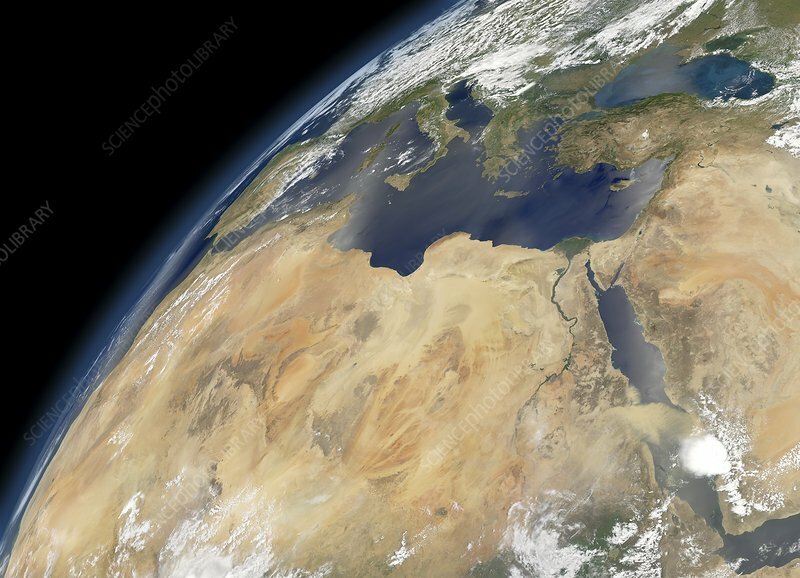 Saharan Mediterranean, satellite image. North is towards upper right. Clouds are white. The land is dominated by the Sahara Desert (brown), stretching for thousands of kilometres across North Africa. The Nile (centre right) is in Egypt, with the Red Sea separating Egypt from the deserts of the Arabian Peninsula (far right). Across upper centre is the Mediterranean Sea with the Black Sea at top right. Europe, with clouds, is across top. Image data obtained on 8 July 2008, by the Moderate-resolution Imaging Spectroradiometer (MODIS) instruments on NASA's Aqua and Terra satellites, part of the Earth Observing System (EOS).